Official Asus USA online store adds ZenPad tablet(s). No accessories yet! We’ve had quite a few inquiries about the ZenPad accessories, in particular the TriCover cases. We have not seen any listing anywhere on the planet for the official accessories. Have you? Please send us an email if you have and we will post details. However, hope may be on the horizon. 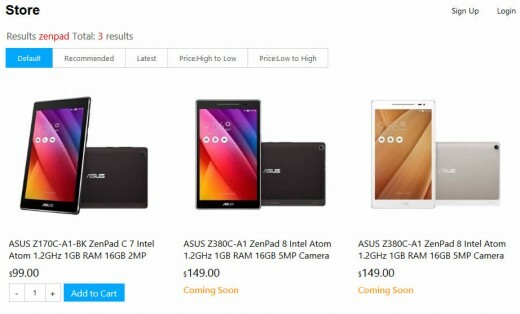 The official Asus store for the US market has now listed a few ZenPad tablets. No accessories, but if anyone will have the accessories, we would hope the official Asus online store would. Right now the $99 ZenPad C 7.0 (Z170) is shipping and the ZenPad 8.0 (Z380C) models are listed as “coming soon”. Update: In fact, now on the US store, you will find just the ZenPad C 7.0 model listed. When I search for “zenpad” I don’t see the coming soon items, just the Z170C-A1-BK. Did they take them down? I do believe so. However, from what I’ve seen, things change often over the course of a day or days. Boom, one day we might see the Z580CA! Heh, too soon for that but I’m sure more ZenPads will be on there during this week.